This 1-hour class will focus on teaching the tumbling skills used in cheerleading, dance and karate. Skyline uses safe and effective progressions to develop these skills. 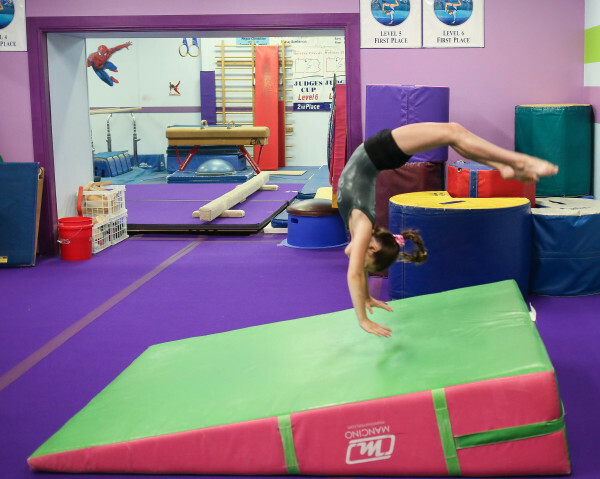 We have a spring floor, Tumbl Trak, air mat, and trampoline along with barrels, wedges and back handspring trainers to make learning safe and fun. Classes are divided into levels and age groups to maximize learning. If you are not sure where to place your child, please call Skyline at 717-845-3047 before registering. In this tumbling class important foundations like cartwheels, handstands, round offs and walkovers to prepare for handsprings will be taught. This class will focus on handspring progressions and front and back handsprings. Gymnasts must have a strong foundation in gymnastics and be able to do walkovers and round offs well to enroll in intermediate tumbling. Gymnasts must be able to do a back handspring by themselves to enroll in this class. Tumbling series will be taught. The sky is the limit for this level!